South American metal working seems to have developed in the Andean region of modern Peru, Bolivia, Ecuador, Chile, and Argentina with gold and copper being hammered and shaped into intricate objects, particularly ornaments. Recent finds date the earliest gold work to 2155–1936 BCE. and the earliest copper work to 1432–1132 BCE. Ice core studies in Bolivia however suggest copper smelting may have begun as early as 2000 BCE. These works originated in the context of a society undergoing social and economic changes but still very much a small food producer and not yet quite sedentary. This contrasts with the idea that this type of metal work developed in societies with enough food surplus to support an élite. Rather than being a product of a hierarchical society, gold might have been meshed in the development of such a society. Further evidence for this type of metal work comes from the sites at Waywaka (near es:Andahuaylas, Lugares de interés, southern Peru), Chavín and Kotosh, and it seems to have been spread throughout Andean societies by the Early horizon (1000–200 BCE). Unlike in other metallurgy traditions where metals gain importance due to their widespread use in fields ranging from weaponry to everyday utensils, metals in South America (and later in Central America) were mainly valued as adornments and objects representative of a high status (though some more functional objects might have been[original research?] produced). During the Early horizon, advancements in metal working result in spectacular and characteristically Andean gold objects made by the joining of smaller metal sheets, and also gold-silver alloy appears. Two traditions seem to have developed alongside each other – one in northern Peru and Ecuador, and another in the Altiplano region of southern Peru, Bolivia and Chile. There is evidence for smelting of copper sulphide in the Altiplano region around the Early horizon. Evidence for this comes from copper slag recovered at several sites, with the ore itself possibly coming from the south Chilean-Bolivian border. Extensive use of "portable" smelting kilns in the vicinity of Puma Punku, Bolivia and at three additional sites in Peru and Bolivia to manufacture, in situ, "I" beams as connectors to large stone blocks during the construction process represent a seemingly anomalous function for metal smelting. The reported chemical analysis of these metal pours is 95.15% copper, 2.05% arsenic, 1.70% nickel, .84% silicon and .26% iron. The estimated date of these pours lies between 800 –500 BCE. Evidence for fully developed smelting, however, only appears with the Moche culture (northern coast, 200 BCE–600 CE). The ores were extracted at shallow deposits in the Andean foothills, whether by specialised workers or slaves/prisoners is unclear. In any case the ores are believed to have been smelted at nearby locations, evidenced in the actual metal artifacts and from ceramic vessels depicting the process, which is believed to have occurred in adobe brick furnaces with at least three blow pipes to provide the air flow needed to reach the high temperatures. The resulting ingots would then have been moved to coastal centers where shaping of the object would occur in specialised workshops. Both of the workshops found and studied were located near the administrative sections of the respective towns – again indicative of the high value placed upon metal. This technology gradually spread north into Colombia, Panama and Costa Rica, reaching Guatemala and Belize by 800 CE. By c.100-700 CE, 'depletion gilding' was developed by the Nahuange culture of Colombia to produce ornamental variations such as 'rose gold'. Gold, copper and tumbaga objects started being produced in Panama and Costa Rica between 300–500 CE. Open-molded casting with oxidation gilding and cast filigrees were in use. By 700–800 CE, small metal sculptures were common and an extensive range of gold and tumbaga ornaments comprised the usual regalia of persons of high status in Panama and Costa Rica. Metallurgy only appears in Mesoamerica in 800 CE with the best evidence from West Mexico. 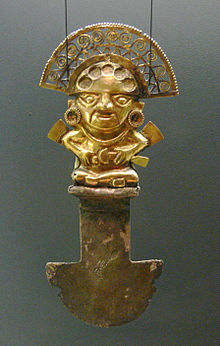 Much like in South America, fine metals were seen as a material for the elite. Metal's special qualities of colour and resonance seemed to have appealed most and then led to the particular technological developments seen in the region. Exchange of ideas and goods with peoples from the Ecuador and Colombia region (likely via a maritime route) seems to have fueled early interest and development. Similar metal artifact types are found in West Mexico and the two regions: copper rings, needles and tweezers being fabricated in the same ways as in Ecuador and also found in similar archaeological contexts. A multitude of bells were also found, but in this case they were cast using the same lost-wax casting method as seen in Colombia. During this period, copper was being used almost exclusively. Continual contact kept the flow of ideas from that same region and later, coinciding with the development of Andean long distance maritime trade, influence from further south seems to have reached the region and led to a second period (1200–1300 CE to the Spanish arrival). By this time, copper alloys were being explored by West Mexican metallurgists, partly because the different mechanical properties were needed to fashion specific artifacts, particularly axe-monies – further evidence for contact with the Andean region. However, in general the new properties such alloys introduced were developed to meet regional needs, especially wirework bells, which at times had such high tin content in the bronze that it was irrelevant for its mechanical properties but gave the bells a golden colour. The actual artifacts and then techniques were imported from the south, but west Mexican metallurgists worked ores from the abundant local deposits; the metal was not being imported. Even when the technology spread from West into north-eastern, central and southern Mexico, artifacts that can be traced back to West Mexican ores are abundant, if not exclusive. It is not always clear if the metal reached its final destination as an ingot, an ore or a finished artifact. Provenance studies on metal artifacts from southern Mesoamerica cast with the lost-wax technique and dissimilar to west Mexican artifacts have shown that there might have been a second point of emergence of metallurgy into Mesoamerica there since no known source could be identified. The Aztecs did not initially adopt metal working, even though they had acquired metal objects from other peoples. However, as conquest gained them metal working regions, the technology started to spread. By the time of the Spanish conquest, a bronze-smelting technology seemed to be nascent. Archaeological evidence has not revealed metal smelting or alloying of metals by pre-Columbian native peoples north of the Rio Grande; however, they did use native copper extensively. As widely accepted as this statement might be it should not be considered synonymous with a lack of metal objects, as it points out native copper was abundant particularly in the Great Lakes region and "overlooks the simple fact that there was really very little to be gained by smelting..." The latest glacial period had resulted in the scouring of copper bearing rocks. Once the ice retreated, these were readily available for use in a variety of sizes. Copper was shaped via cold hammering into objects from very early dates (Archaic period in the Great Lakes region: 8000–1000 BCE). There is also evidence of actual mining of copper veins (Old Copper Complex), but disagreement exists as to the dates. Extraction would have been extremely difficult. Hammerstones may have been used to break off pieces small enough to be worked. This labor-intensive process might have been eased by building a fire on top of the deposit, then quickly dousing the hot rock with water, creating small cracks. This process could be repeated to create more small cracks. The copper could then be cold-hammered into shape, which would make it brittle, or hammered and heated in an annealing process to avoid this. The final object would then have to be ground and sharpened using local sandstone. Numerous bars have also been found, possibly indicative[original research?] of trade for which their shaping into a bar would also serve as proof of quality. Great Lake artifacts found in the Eastern Woodlands of North America seem to indicate there were widespread trading networks by 1000 BCE. Progressively the usage of copper for tools decreases with more jewellery and adornments being found. This is believed to be indicative of social changes to a more hierarchical society. However this Great Lake model as a unique source of copper and of copper technologies remaining somewhat static for over 6,000 years has recently come into some level of criticism, particularly since other deposits seem to have been available to ancient North Americans, even if a lot smaller. During the Mississippian period (800–1600 CE, varying locally), elites at major political and religious centers throughout the midwestern and southeastern United States used copper ornamentation as a sign of their status by crafting the sacred material into representations connected with the Chiefly Warrior cult of the Southeastern Ceremonial Complex (S.E.C.C.). This ornamentation includes Mississippian copper plates, repousséd plates of beaten copper now found as far afield as Alabama, Florida, Georgia, Illinois, Mississippi, Oklahoma, and Tennessee. Some of the more famous of the plates are of raptorial birds and avian-themed dancing warriors. These plates, such as the Rogan plates from Etowah, the Spiro plates from the Spiro in Oklahoma, and the Wulfing cache from southeast Missouri, were instrumental in the development of the archaeological concept known as the S.E.C.C. The only Mississippian culture site where a copper workshop has been located by archaeologists is Cahokia in western Illinois. Excavations of the copper workshops at Mound 34 (a small mound located on the Ramey Plaza east of Monks Mound) indicate copper was worked there. Numerous copper fragments as well as ashes from fires were found in the area as well as the remains of three tree stumps thought to have been used to hold anvil stones used for beating out the flattened sheets of copper. After the collapse of the Mississippian way of life in the 1500s with the advent of European colonization, copper still retained a place in Native American religious life as a special material. Copper was traditionally regarded as sacred by many historic period Eastern tribes. Copper nuggets are included in medicine bundles among Great Lakes tribes. Among 19th century Muscogee Creeks, a group of copper plates carried along the Trail of Tears are regarded as some of the tribe's most sacred items. Native ironwork in the Northwest Coast has been found in places like the Ozette Indian Village Archeological Site, where iron chisels and knives were discovered. These artifacts seem to have been crafted around 1613, based on the dendrochronological analysis of associated pieces of wood in the site, and were made out of drift iron from Asian (specifically Japanese) shipwrecks, which were swept by the Kuroshio Current towards the coast of North America. The tradition of working with Asian drift iron was well-developed in the Northwest before European contact, and was present among several native peoples from the region, including the Chinookan peoples and the Tlingit, who seem to have had their own specific word for the metallic material, which was transcribed by Frederica De Laguna as gayES. The wrecking of Japanese vessels in the North Pacific basin was fairly common, and the iron tools and weaponry they carried provided the necessary materials for the development of the local ironwork traditions among the Northwestern Pacific Coast peoples, although there were also other sources of iron, like that from meteorites, which was occasionally worked using stone anvils. ^ a b c Mark Aldenderfer; Nathan M. Craig; Robert J. Speakman; Rachel Popelka-Filcoff (2008). "Four-thousand-year-old gold artifacts from the Lake Titicaca basin, southern Peru". PNAS. 105 (13): 5002–5005. doi:10.1073/pnas.0710937105. PMC 2278197. PMID 18378903. ^ Martin, S.R. (1999). Wonderful Power: The Story of Ancient Copper Working in the Lake Superior Basin. Great Lakes Books Series. Wayne State University Press. p. 136. ^ Anawalt, Patricia Rieff. "Ancient Cultural Contacts between Ecuador, West Mexico, and the American Southwest: Clothing Similarities." Latin American Antiquity 3, no. 2 (1992): 121. ^ a b Bruhns, K.O. (1994). Ancient South America. Cambridge University Press. ^ Keatinge, R.W. (1988). Peruvian Prehistory: An Overview of Pre-Inca and Inca Society. Cambridge University Press. ^ G. Horz, M.K. (2000). "The treasure of gold and silver artifacts from the Royal Tombs of Sipan, Peru - a study on the Moche metalworking techniques". Materials Characterization. 45 (4–5): 391–420. doi:10.1016/s1044-5803(00)00093-0. ^ Lechtman, H. (1991). "The Production of Copper-Arsenic Alloys in the Central Andes: Highland Ores and Coastal Smelters?". Journal of Field Archaeology. 18: 43–76. doi:10.1179/009346991791548780. ^ Lechtman, H. & Klein, S. (1999). "The Production of Copper–Arsenic Alloys (Arsenic Bronze) by Cosmelting: Modern Experiment, Ancient Practice". Journal of Archaeological Science. 26 (5): 497–526. doi:10.1006/jasc.1998.0324. ^ J. C. Chaston. "The Powder Metallurgy of Platinum : An Historical Account of its Origins and Growth". ^ Megan Gannon. "Rose Gold Jewelry Was All the Rage with Ancient Colombians". Livescience. ^ Jeffrey Quiltes & John W Hoopes (2003). Gold and Power in Ancient Columbia, Panama and Costa Rica. Harvard: Dumhurton Oakes. pp. 220–223. ^ a b c Hosler, D. (1988). "Ancient West Mexican Metallurgy: South and Central American Origins and West Mexican Transformations". American Anthropologist. 90 (4): 832–855. doi:10.1525/aa.1988.90.4.02a00040. ^ Hosler, D. (1999). "Recent insights into the metallurgical technologies of ancient mesoamerica". JOM Journal of the Minerals. 51 (5): 11–14. doi:10.1007/s11837-999-0034-6. ^ George Rapp Jr, Guy Gibbon & Kenneth Ames (1998). Archaeology of Prehistoric Native America: an Encyclopedia. New York: Taylor & Francis. p. 26. ^ a b c d Martin, S.R. (1999). Wonderful Power: The Story of Ancient Copper Working in the Lake Superior Basin. Great Lakes Books Series. Wayne State University Press. ^ Levine, M.A. (2007). "Overcoming Disciplinary Solitude: The Archaeology and Geology of Native Copper in Eastern North America". Geoarchaeology. 22: 49–66. doi:10.1002/gea.20146. ^ Levine, M.A. (2007). "Determining the Provenance of native copper artifacts from Northeastern North America: evidence from instrumental neutron activation analysis". Journal of Archaeological Science. 34 (4): 572–587. doi:10.1016/j.jas.2006.06.015. ^ a b Robb, Matthew H. (March 2010). "Mildred Lane Kemper Art Museum-Spotlight Series March 2010" (PDF). Saint Louis Art Museum. Retrieved 2012-04-19. ^ a b Pawlaczyk, George (2010-02-16). "Copper men: Archaeologists uncover Stone Age copper workshop near Monk's Mound". SOTT.net. Signs of the Times. ^ "Cahokia Mounds – Mound 34". Cahokia Mounds State Historic Site. Archived from the original on 2012-04-25. ^ Brose, David S.; James A. Brown; David W. Penney (1985). Ancient Art of the American Woodlands Indians. New York: Harry N. Abrams. p. 149. ISBN 978-0-89558-105-1. ^ Quimby, G.I. (1985) Japanese Wrecks, Iron Tools, and Prehistoric Indians of the Northwest Coast. Arctic Anthropology, 22 (2), pp. 7-15. Leibsohn, Dana, and Barbara E. Mundy, “The Mechanics of the Art World,” Vistas: Visual Culture in Spanish America, 1520-1820 (2015). http://www.fordham.edu/vistas.